Be the first to share your favorite memory, photo or story of Nannie. This memorial page is dedicated for family, friends and future generations to celebrate the life of their loved one. 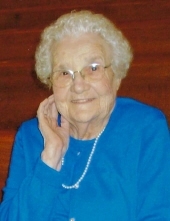 DURHAM: Nannie Cooke Welch, 94, passed away on Wednesday, March 27, 2019 at Hillcrest Convalescent Center in Durham. She was born in Durham, the daughter of the late George W. Cooke and Jessie Couch Cooke. In addition to her parents, Ms. Welch was also predeceased by her husband, John Seaton Welch; son, Robert “Roho” Welch; sisters, Pearl Cooke, Ruth Cooke, Gladys Kennedy; brothers, George Cooke, Otis Cooke. Ms. Welch was a member of Braggtown Baptist Church in Durham where she worked in the nursery for many years. She was a member of the Joy-Fidelis Sunday School Class. She retired from the American Tobacco Company in Durham. Ms. Welch is survived by her daughter, Gloria Welch; grandchildren, Chrystal Clayton (Josh), Craig Welch (Anna); and great-grandchildren, Kadin Brooks, Kensie Welch. The family will receive friends from 5 to 7 p.m. on Friday, March 29th at Clements Funeral Home in Durham. A funeral service will be held at 10:30 a.m. on Saturday, March 30th at Clements Funeral Chapel with Pastor Eric Burmahl officiating. Burial will follow in Maplewood Cemetery. In lieu of flowers, the family request that memorial donations be made to Braggtown Baptist Church: 3218 N Roxboro St, Durham, NC 27704. To send flowers or a remembrance gift to the family of Nannie Cooke Welch, please visit our Tribute Store. "Email Address" would like to share the life celebration of Nannie Cooke Welch. Click on the "link" to go to share a favorite memory or leave a condolence message for the family.